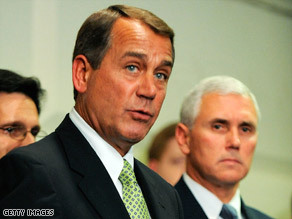 Schneider: GOP's new rallying cry seems to be "back to basics"
House Minority Leader John Boehner, center, and GOP Rep. Mike Pence, right, speak with reporters Tuesday. Nothing is more basic to the Republican philosophy than smaller government, a principle many Republicans believe got lost at the end of the Bush administration. "President Bush in the last few months has opened up the door to Mr. Obama's big-government activism," Ken Blackwell said earlier this month. Blackwell, the former Ohio secretary of state, is one of six candidates running for the chairmanship of the Republican National Committee. Republicans believe they lost in 2006 and 2008 because they became a "me too'' party. And Democrats can play that game better. The battle over the stimulus comes as the Republican National Committee, at its winter meeting this week, is expected to adopt an unprecedented resolution that attacks the $700 billion federal bailout that Bush championed. Most Republicans are balking. They appreciate the president's efforts to reach out to them, but they don't see that spirit of bipartisanship in the Democratic leadership of Congress. In their view, the Democratic bill is wrong in principle. Rep. Mike Pence of Indiana, the House Republican Conference chairman, says the bill that the House Democrats bring to the floor "will literally be a catch-all of traditional pet programs and more government." And it won't work, many Republicans say. Republicans do have an alternative plan. "If you allow American families to keep more of their hard-earned money and provide businesses incentives to create jobs and you decrease spending at the federal level, you grow the economy," Pence says. But Republicans don't have the votes to pass an alternative of their own. Democrats can say Republicans are irrelevant, so they're being irresponsible. But Republicans are not irrelevant. Sure, Obama doesn't need Republican votes, but he still wants them. He doesn't want his recovery plan to be seen as partisan. Meanwhile, Republicans don't want to be seen as complicit in a policy that violates their basic principles.